As the New Year approaches most people are looking for ways to be healthier, happier and lighter as they bring in the year. People question why they are feeling unmotivated or blocked and it’s because ” Darling, you’re chakras are blocked!! !” THE FIRST PLACE to start is by looking at your chakras going within and to use different strategies to clear and re-balance them. As you see in the picture to the left, there are seven main chakras on the body. When these energy centers are healthy, they are spinning in harmony interconnected with each other. These energy centers can be blocked by numerous things in everyday life, whether they be emotional, physical or spiritual. This translates to you not feeling good, feeling negative, feeling unmotivated, not moving forward in your fabulous life and can manifest into diseases. It is oh so important to pay attention and start re-balancing your chakras to feeeeeeeeeeeeel good, attract and live your fabulous life! Exercise!!!!! As you know exercise releases endorphins which make you feeeeeel good. It also releases built up energy. All exercises are fantastic, but YOGA is the big one I find for chakra re-balancing! 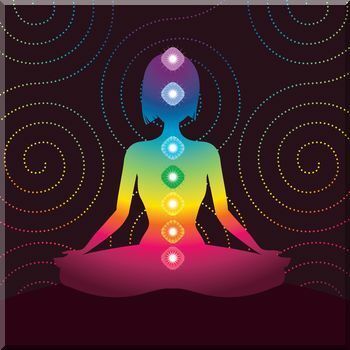 Yoga helps release any emotional or physical tension of unbalanced chakras. Use Archetypes. Each chakras correlates to a different archetypes which helps us better understand our emotional experience. Archtypes are universal themes which can be illustrated through story telling. For example the root chaka is seen as mother as Mother Earth and the Victim.Through story telling of each chakra we learn more about our different values which has shaped us on this journey and ways to express to re-balance them. Ask yourself powerful thought provoking questions daily. Many people live a life of busyness and full of distractions which doesn’t allow them to SEE FACE ON what is going on. Going within and questioning each chakra can help you not sabotage your fabulous life and can be the key of your happiness. Tell another story. Crystal Healing. Crystals have been used from the beginning of time to enhance and re-balance ones journey. Each crystal has a different energy, colour, and healing power that correlates to each chakra. You can position the crystals on and around the chakra you are working on. For a Crystal Healing Treatment with me, please email me at elaine@fabulouslivingcoach.com. Meditation, Your fabulous mind cannot tell they difference between what is real and what you are imagining. Why not heal the past by telling another story. 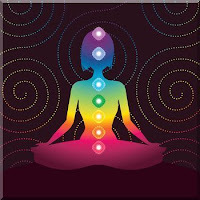 Doing a meditative visualization on each chakra will allow you to revisit and customize an experience anyway that feels good. It’s not about forgetting, but coming to a better emotional state when the memory comes up. On a physical note, meditation helps calm the mind and body which reduces stress giving your physical body the time to rebalance. Reiki , Is a Japanese natural healing technique which heals physical, emotional and spiritual bodies. Ask your local Reiki Practitioner, or me!!! In a reiki treatment the practitioner channels energy from Source/God/Universe which works and flows through them ( like a vessel). This pure light, life force of energy when placed on each chakra pours over the chakra and brings it up vibrationally rebalance and clear any blockage. Alters, An alter is your own sacred space where you can can connect, celebrate and hold rituals with whichever chakra you want to work on. In your alter you can include any items you feel resonate with the chakra. It’s your own sacred space, so you should only include items that are meaningful to you. It can include a crytals, an object, a picture for example. An exiting workshop with your Fabulous Living Coach learning different strategies in Clearing Your Chakras. We will be discovering how you can include different modalities to feel lighter, happier and healthier so you can feeeeeeel good in the present moment and have positive energy to be in a vibrational match with that in which you would like to experience in your fabulous life! We will be exploring crystals, meditation, archetypes, sound, some favourite yoga postures, alters, and affirmations. Workshop includes a workbook with all the fabulous steps. In the Thornhill area.